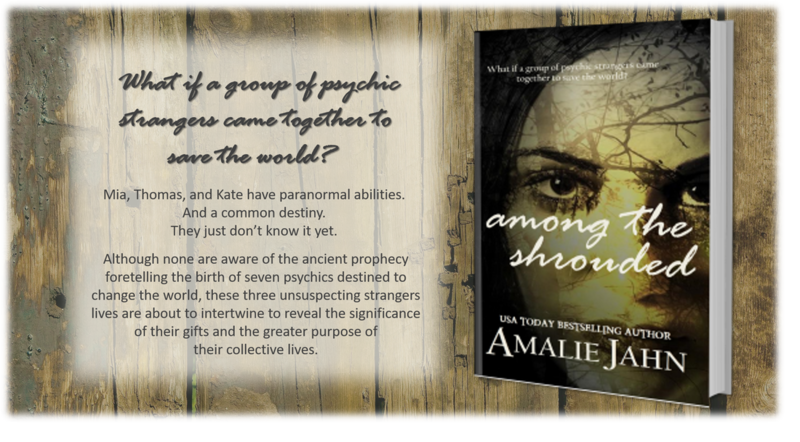 What if a group of psychic strangers came together to save the world? Mia, Thomas, and Kate have paranormal abilities. Mia Rosetti is used to being different, especially since she can tell if people are good or evil just by looking at their auras. But when a mysterious (and handsome) stranger walks into her life without one, she starts questioning her power and begins a search to find the true purpose of her gift. What she doesn’t know is that aura-less Thomas harbors secrets of his own - an abusive childhood and the ability to avoid danger. Halfway around the world, Kate uses a form of telepathy to provide for her sisters and is excited by the prospect of going to the United States to secure their financial independence. She began coming to the lineup room just after her seventh birthday, several years after she revealed her gift to her father, the Chief of Police, Carlos Rosetti. “Who do you think did it?” her partner Jack whispered. She wrinkled her nose and squinted, pushing closer to the glass in front of her. “I don’t know exactly. Two have dark auras, but one of them is darker than the other. He’s probably our guy. Whatever he’s done is recent.” She didn’t take her eyes off the possible suspects as the door to the lineup viewing room opened. The woman hesitated, scanning the row of men before her. “The second one, there on the left. I believe that’s him,” she responded at last. He escorted the elderly woman out of the room and returned with a middle aged man in a well-tailored suit. In the adjacent room, the line of short, fat men filed out and another group shuffled in. The men in the second lineup were just over six feet tall with thin, muscular physiques. Mia gasped audibly, causing both men to turn. Jack raised an eyebrow in her direction. The men turned back to the lineup and she remained silent for the remainder of the process, although she was unable to take her eyes from the last man in the row. He was attractive, almost strikingly so, but his face could not hide a sadness lurking just beneath the surface. However it wasn’t the man’s features she found so alarming. For her, there was something even more unusual about the man. Mr. Franklin quickly identified who he believed to be the vandal and was immediately ushered from the room. Once they were alone, Jack could no longer curb his curiosity. “What’s the matter? Did he pick the wrong guy?” he asked. “I don’t know,” she responded, still unable to comprehend what she had just seen. “You don’t know?” he said incredulously. “No, Jack. I don’t know,” she replied, her voice rising. Instead of responding to her partner, she turned on her heel and left the room without further explanation. The door slammed behind her and she nervously scanned the hallway for the lineup detective, Peter Winchester. She spotted him coming around the corner at the far end of the hall. “Pete! Hold up! I have to talk to you,” she shouted. Pete stopped walking and headed back down the hall in her direction. “The last group…” she began, before he interrupted. She paused. “No. Nothing like that. I thought he looked a lot like an old classmate of mine, but I guess not. Thanks, Pete,” she lied, unwilling to disclose the truth about her inquiry. “No problem. Anyway, have a good weekend, Mia. I have tomorrow and Sunday off. First time in months,” he said. “Have fun,” she replied absently as she headed in the opposite direction, down the hall toward her office. She was grateful to be alone as she sat at her desk, and hoped Jack would be occupied elsewhere in the station for a while. She held her head in her hands, trying to understand why she had been unable to see Thomas Pritchett’s aura. For the first time in over twenty years, her confidence in her ability was shaken. She recalled the only other time in her life when the validity of what she saw had been brought into question. The auras had been a part of her life for as long as she could remember. For many years as a child, she had wrongly assumed that everyone saw the world as she did, with each person surrounded by a veil of light or dark. In the beginning, she didn’t know what the difference represented. When she was four, her mother took her to visit her father at the police station for the first time. Until that point in her life, she had only seen people with auras that were light. There were some that were noticeably dimmer than others but everyone she came into contact with had radiated some form of light. However, as they’d entered the building that fateful day, an officer walked past her escorting a man in handcuffs. The detainee was cursing and screaming as he was led into the booking area. She was shocked to see his aura had no light and instead he appeared to be shrouded in a veil of darkness. She had immediately questioned her mother about what she had seen and repeatedly asked what had happened to the man’s light. “Good girls don’t make up stories or tell lies,” her mother had scolded as she swatted her on the bottom for being an embarrassment and causing a scene. That night, she had trouble falling asleep. From under her blankets she laid awake listening to her mother and father arguing about her outburst at the station. Her mother was convinced Mia was either possessed by an evil spirit or had some kind of psychiatric disorder requiring immediate medical attention. Her father, on the other hand, felt a 4-year-old could not be trusted to tell the truth and that her outburst had simply been the result of an overactive imagination. At some point, no longer able to listen to their fighting, she had crept down the stairs and joined her parents in the dim light of the kitchen. That night, she understood for the first time that her parents did not see what she saw. They were unable to see the auras. She realized no one could. She tried in vain to explain to them how everyone appeared to her, bathed in a wash of luminosity, but they didn’t understand. It would be many years until her father would open his mind to the promise of her gift, and sadly, her mother would never accept there were parts of the world that were beyond her understanding. Mia was roused from her thoughts by a presence in the room. “Jack said I might find you in here,” said Major Rosetti from the doorway. After she revealed her gift to him, her father eventually accepted and embraced her unique view of the world. However, he had always encouraged her to keep her visions private so others wouldn’t be able to take advantage of her abilities. Out of respect and love for him, she had done just that, sharing her secret with only a handful of people in her life. What he didn’t know however, was since the day she discovered that her ability was unique, she had been searching for both a cause and a purpose for her gift. Isolated by her secret, she sought out others like her – people with the ability to see the world in different ways. By the age of eleven, she’d expanded her search beyond the people she knew to include a worldwide audience, scouring the internet for stories of people with extraordinary capabilities. She discovered people with incredible strength, those who claimed to speak to the dead, and even a few whose stories rivaled her own in strangeness, but despite her loneliness, she’d never worked up the courage to correspond with any of them. “Is that unusual?” he asked. Rosetti sat in the chair at Jack’s desk and ran his fingers through his thinning hair. Mia shook her head at his single-mindedness. “No, Dad. No. I’m fine. I’m working on my case load. It’s just… I don’t know. I thought I had this thing all figured out. The light, the dark, the shades and variations. But this? This nothing? It’s new. I don’t do well with new,” she said, looking at her father solemnly across the room. “Love you too, Dad,” she said, rolling her eyes and smiling at his ability to brush her concerns aside so easily. Once he shut the door behind him, Mia wasted no time retrieving a manila envelope from the bottom drawer of the file cabinet she and her partner shared. She slid her casework to the side and emptied the contents of the envelope onto her desk. Newspaper clippings, printed copies of internet searches and her master list sat before her. She scanned the list of names scribbled in various colored inks on the yellowing piece of wide-ruled paper, torn from her seventh grade social studies notebook. Many of the frayed spiral edges were still intact. Somewhere between disappointment and relief, she discovered Thomas Pritchett’s name was absent from her list of psychics – people who were gifted just like her. Her pen hesitated above the page as she was unsure whether to add his name to the group. She chewed on the plastic pen cap. Was the reason she couldn’t see his aura due to his own peculiarity or was something going terribly wrong with her own ability? After finally deciding to add his name to the list in pencil, she returned her file to the cabinet just as Jack appeared in the doorway. “Heading out?” he asked, tossing his keys on his desk. She glanced at the wall clock. Her shift had ended hours ago. “Yeah. I guess so. You?” she asked, slipping her jacket off the back of her chair. “Not yet. I still have to log the evidence inventory from the assault in Fells Point on Tuesday. What a mess that’s been. It’s always the drunk guys, right?” he laughed, winking at their inside joke. “Always the drunk guys,” she confirmed, as she passed behind him on her way to the door. “I’m sure it was a fluke. See you in the morning,” he called as she headed into the hallway. “Bright and early,” she said. After leaving the station, she drove to the Parkville apartment she shared with her best friend Chelsea. The two grew up living across the street from one another, and Mia had always been drawn to her because of the brightness of her light. Chelsea radiated goodness and she found herself inexplicably drawn to people with the brightest auras. So although their lives had taken different paths career wise, she found she functioned better with Chelsea in her day to day life, especially considering the darkness she was surrounded by at work. After graduating from the police academy, she reconnected with Chelsea, who spent four years earning her degree in education. The plan was for them to share an apartment for a while, until they both established themselves financially. Two years later, they were still living together. She was relieved to see Chelsea’s subcompact parked in front of their building as she pulled into the parking lot. “Rough day?” she asked as Mia came through the door, tossing her sidearm and belt on the table. “A guy?” Chelsea asked, raising an eyebrow in her direction. Mia uncorked the bottle of wine. “Neither. What are you doing tonight?” she asked in an attempt to change the subject. She spent the rest of the evening trying desperately to forget about Thomas Pritchett and his missing aura, but her mind kept wandering back to him. She wasn’t sure if it was the missing aura or the sadness she saw in the lines of his face, but she was convinced there was more to him than met the eye.